Access your garage and home without the use of a key or a remote control. 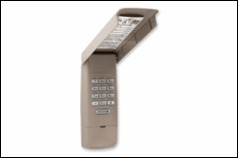 The LiftMaster® Wireless Keyless Entry can open your garage door using a code that you program directly into the unit. There is also a temporary password option that enables family, friends, or service people to enter the garage without giving them your personal code. You can view or download the following 977LM Liftmaster Wireless Keyless Entry programming instructions.